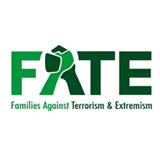 Families Against Terrorism and Extremism (FATE) is an umbrella organisation founded by the Quilliam Foundation bringing together grassroots organisations from across Europe in the fight against extremism and terrorism. FATE is addressing the issue that very little focus has been given in the past by law enforcement or policy makers to whole family approaches and the vital role of the family in either encouraging or stemming the risk of radicalisation. ISIS are using grooming tactics to radicalise young men, women and even mothers and fathers by using social media and strong transnational support networks, creating a sense of family belonging and security. Where second and third generation immigrants may feel a disconnect with their host society’s values and beliefs, then terrorist groups such as ISIS can lever this vulnerability and radicalise not only the young and the vulnerable but whole families. There are two types of roles families play within the landscape of counter-terrorism, those who will support jihadism and those who are oblivious to the signs and see their loved ones slowly radicalised before their eyes. The second type of family is unable to stop the process because they have no tools, lack support and nowhere to ask for advice, from either support services, police or government. The issue of disempowered mothers is not a new issue and has been voiced many times by communities, the voluntary sector, academics and especially women in the UK since the launch of Prevent in 2009. FATE want to amplify the work of the grassroots organisations to inspire change with locally led activist projects. FATE will act as an umbrella for these organisations and use the Quilliam influence, reputation, contacts and legacy to gain international reach for locally led work. The UK has a range of deradicalisation tools and programmes such as the School’s Prevent Duty, Local Authority Prevent leads and legacy referral tools such as Channel and WRAP. Police also invested heavily in the anti-terror table top community tools such as ACT Now and Operation Nicole, which did little to stem the rise of radicalisation post-Arab Spring and the rise of ISIS (Daesh). However, the UK Prevent strategy still fails to engage mothers, the family and the community to combat radicalisation. The success of the family-led approach “Troubled Families” (for intergenerational offender families) led by Louise Casey from the Department of Communities and Local Government (DCLG), resulted in some mention of adapting the UK Troubled Families project into a family focused deradicalisation programme. UK representation at the FATE conference included Baroness Pauline Neville-Jones (former Minister of State for the Home Office) and Rt Hon. Mark Simmonds from the Counter-Extremism Project. Both UK speakers agreed in their public address that mothers needed empowering and tools to deal with the early signs of radicalisation. The majority of their discourse was directed at Muslim communities needing to drive change from within via discourse and advocating fundamental cultural changes if the threat of radicalisation was to be challenged and eradicated. Daniel Koehler, the founder of GIRDS, developed approaches to de-radicalization in the form of worldwide family counselling programmes and published numerous articles and chapters on the topic. He has worked as a de-radicalization and family counsellor in multiple programmes for right-wing and Islamist extremism. He studied religious studies, political sciences, and economics at Princeton University and Free University Berlin and specialised in topics such as terrorism, radicalization, and de-radicalization. In June 2015, Daniel Koehler was named a fellow of George Washington University’s new Programme on Extremism at the Centre for Cyber and Homeland Security. He will be designing policies and resources for community-based ‪de-radicalization programmes in the United States. He also supports several mothers programmes in Europe. In 2016, he was appointed to be the first court expert on de-radicalization in the United States of America at the District Court in Minneapolis and has conducted risk assessment and de-radicalization evaluations of terrorist offenders in prison and trained expert personnel from various US Government agencies. Mothers for Life was founded by Christianne Boudreau and is coordinated by both Daniel Koehler (GIRDS) and Christianne. It is a network of mothers from across the globe who have had experienced violent jihadist radicalization in their families. Many of the mothers have seen their sons and daughters travel to Syria and Iraq where they have either not returned or died in combat. They also support women whose husbands have been radicalised and subsequently travelled to Afganistan or Syria to join terrorist organisations. The principal aim of Mothers for Life is to bring mothers together and provide them with the safety of a secure network of people who share those experiences, heal wounds and look for solutions. Mothers for Life want to give a strong and unified voice and counter-narrative to mothers and help them tell their stories. They coordinate activities and provide guidance and counsel. Membership is free to any mother who approaches them and the organisation operates in Canada, The United States of America, Germany, Denmark, Belgium, The Netherlands, Sweden, and France. Edit Schlaffer is a social scientist, writer, activist who founded Women without Borders, an international research-based NGO, encouraging women to take the lead in their personal and public lives. Her research focuses on women as agents of change and as driving forces to stabilise insecurities throughout the world. In 2008, she launched SAVE – Sisters Against Violent Extremism, the world’s first female counter-terrorism platform. SAVE developed the Mothers School, which is a project designed to empower women to take an active role in safeguarding their families against the threat of violent extremism. The Mothers School has a curriculum and workshops that offer worried mothers training in personal, communication and parenting skills so they can recognise and react to early warning signs of possible radicalization in their children. Mothers can also learn to provide counter-narratives and offer alternatives that foster positive youth development and resilience. Mothers School provides mothers with the skills and the tools for prevention and intervention where they can make a difference in the heart of their homes and communities. Mothers School wants to promote this concept on a global scale, creating an international Mothers School movement and plans to create Fathers School shortly. Mothers School is a similar model to the early Prevent approaches in the UK where police liaison, the voluntary sector, and local authorities worked with the most vulnerable women in densely populated Muslim areas, to build confidence, life skills, and cohesion. This approach was heavily criticised by the incoming government in 2010, for being not Prevent specific or targeted enough. A full revision of the Prevent Strategy was conducted in 2011. Sons and Daughters of the world founded by Karolina Dam from Denmark whose son Lukas left for Syria in 2014 to fight with ISIS and was killed by an Amercian Airstrike. Karolina developed the organisation to reach out to the parents and to let them know that they are not alone when their children become involved in terrorist activity. The goal of Sons and Daughters of the World is to create wider awareness of knowledge and facts and to point parents, mentors, teachers, social workers towards the help they need to stop radicalisation from occurring. Karolina points out that Sons and Daughters of the World are not a deradicalisation toolkit or programme. Karolina works closely with Christianne Boudreau from Mothers for Life. She contacted Christianne for advice and support when her son Luksa suffered the same fate as Damian in Syria. Karolina is another mother who noticed small tell tale signs but had nowhere to go nor did the authorities act when Lukas showed signs of vulnerabilities. Lukas like Damian also converted due to emotional problems. During the early days of conversion to Islam both boys showed positive signs in their behavioural changes but after becoming under the influence of older men, their change in attitude and intolerance towards other faiths and their families’ values and beliefs became apparent. Bjørn Magnus Jacobsen Ihler is a survivor of the July 2011 attacks on Utøya Island in Norway when right-wing extremist Anders Behring Breivik shot and killed 69 people and injured 110 people. He is one of ten young leaders on the Extremely Together Project founded by Kofi Anan and founder of the Forgiveness Project. Bjørn is now working against extremism and hatred through a variety of means including writing, talks, filmmaking and theatre productions on related topics. Lorin informed the police, but the call handler was not qualified or knowledgeable about the dangers of grooming. A few weeks later Breck was lured to the house of the predator and murdered. While Breck was not groomed for radicalisation and extremism, it was important to see how powerful the process of grooming is on the mind of a young person and how it can alienate young people even from their loved ones. It highlights the gaps in policy and law enforcement training to safeguard young people against grooming, exploitation, and radicalisation. Parents need tools and support. 7. Technology, Internet, Social Media and Extremism Presentations. Google geographically mapped jihadi linked word searches against individual users and sent mental health links to their browsers. They then monitored the number of interactions with a control group and found that people who searched for jihadi-related information on the internet were more likely to clink on the links for health mental support. Facebook presented a strategy of bombarding hate pages with messages of peace and love. Childnet introduced their new radicalisation awareness tools which are being rolled out to schools across the UK. As a result of losing sons and daughters to ISIS in Syria, many mothers have started their own organisations or have sort support from other larger organisations to tell their story. The organisations started by the mothers of jihadist are struggling regarding funding and sustainability. The lack of funding is largely due to the fact their governments seem to have been less than supportive or that specific funding is hard to obtain for CVE. Access to funding and even writing funding bids is hard to do and support is urgently required if the work of mothers is to be valued and continued. FATE’s vision is to create a family of organisations under one umbrella who will network via social media, meetings, workshops, and conferences. The engagement will enable the FATE family to build capacity and resilience by sharing ideas, providing mutual support and advice on funding and projects. 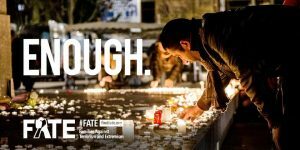 Currently, they have developed a Twitter campaign #FATE #Enough and a private Facebook community for members of the FATE family to liaise with each other. There is a discussion about holding future events either locally or nationally and the FATE family growing into a bigger entity. 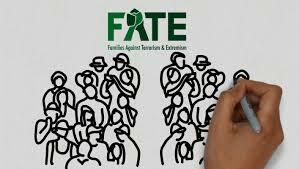 FATE will act as a hub and a facilitator to continue to gain global traction on the issue of families and extremism. Organisation will upload the FATE logo on their websites as a partner and use FATE as a hub to find new support, new opportunities, and new networks. Organisations are encouraged to share their work with FATE such as campaigns, articles and new articles and toolkits. FATE will amplify the content and work with new audiences. The FATE team is offering to attend events and bring their knowledge and contacts to support the smaller organisations. FATE are promoting co-ownership and network input to help the FATE family run, by asking the family of organisations to either run social media, be a FATE co-ordinator, produce new content or bring new partners to the FATE family. The agony and fear of losing a loved one is universal to us all. We all share it. The pain of emptiness, longing and anger can be overwhelming. 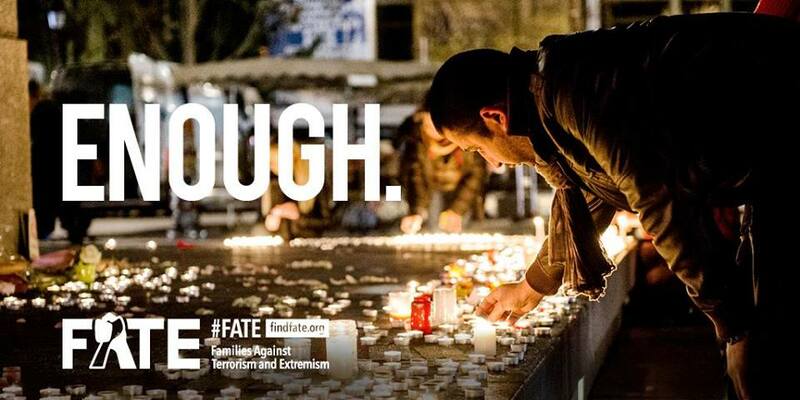 But worse than losing a loved one, is losing a loved one to violent extremism. A tragedy that can be prevented. The days, weeks, months, years….